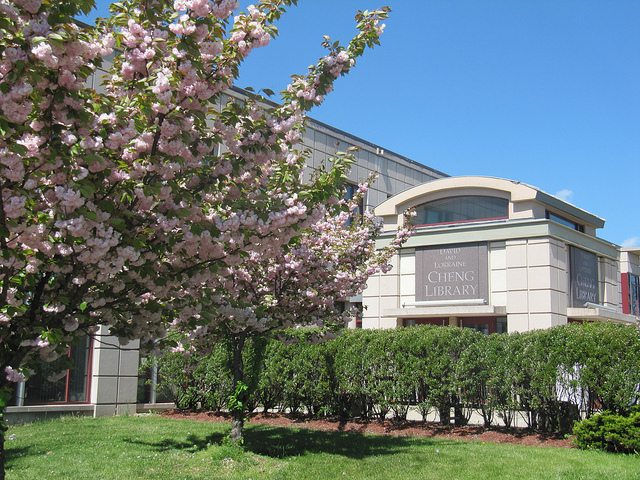 We were thrilled to receive a message recently from Professor Sarah E. Hughes, Access Services Librarian at the David & Lorraine Cheng Library at William Paterson University. Along with managing the many responsibilities of her role, Professor Hughes took it upon herself to analyze and explain an efficiency measure that she incorporated at the library: using a Teamup Calendar. Professor Hughes identified two challenges that librarians face: staff scheduling, and communicating relevant information to staff across varying schedules. Scheduling an entire department, along with a public service point desk, can be a notoriously time-consuming task. …Some managers may be in the habit of using their personal Outlook or Google Calendar to put together a weekly schedule. However, the schedule information needs to be communicated to the department in a way that is accessible to all employees who come from a variety of backgrounds and could be part-time staffers. An ongoing struggle in many libraries is being able to communicate relevant information across varying shifts. …It is imperative to keep all staff informed not only of scheduling related information, but significant changes in library operation hours, events taking place in the library, and other pertinent information staff may need to share with patrons. These challenges are not unique to libraries, of course. Many organizations deal with similar issues, and the supervisors and managers tasked with handling scheduling, staff communication, and similar responsibilities spend many hours per week on them. If individuals and organizations can find ways to handle these tasks more efficiently, everyone benefits. Communication can be smoother and more consistent; scheduling can be done more quickly. As a result, individuals can put more energy and time into proactive projects and responsibilities beyond the logistics of day-to-day operations. The tricky part is finding a solution that works well. A good solution needs to be powerful and feature-rich enough to handle the complex information that’s part of these responsibilities. In order to work well for different organizational scenarios, it also needs to be customizable. And in order to get full adoption from all staff members and others involved, the tool needs to be user-friendly and accessible. Additionally, there are systems, ingrained habits, staff preferences, and other factors to consider in finding a solution. What’s the current solution being used, and how can it be improved? Historically, within the Cheng Library’s Lending Services department, the Access Services Librarian distributed a printout paper-based monthly calendar to communicate monthly scheduling to full-time and part-time staff members. The paper calendar was supplemented with weekly “What’s Happening This Week” emails, also sent by the Access Services Librarian to all staff members in the department. How do staff members and other individuals best communicate? Another consideration for communication in public services departments is that staff members process information in a variety of ways. Some staff may prefer face-to-face, verbal interactions with their manager. Others may need to have information in writing. How often does communication need to happen? To distribute up-to-date schedules is one layer of the solution, but to give staff notice of daily changes and meetings is a final piece of the puzzle in public services. What factors are involved in staff scheduling? Outside of ensuring that the service desk is consistently covered, managers must consider staff vacation time, sick days, among other events that arise when developing a department schedule. 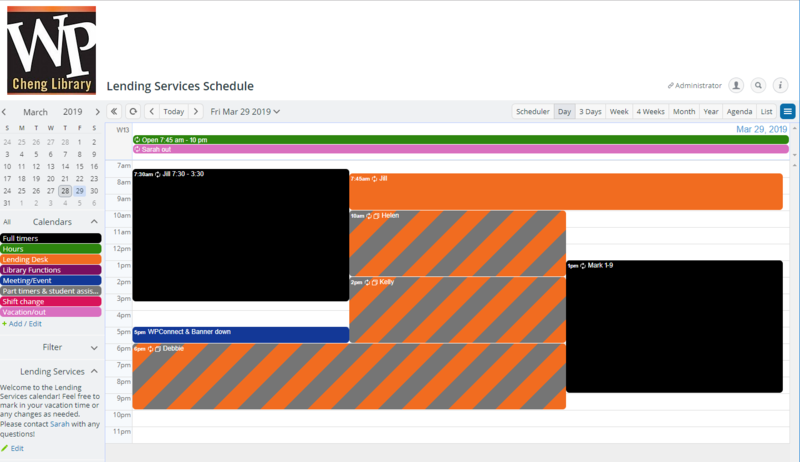 Adopting a web-based calendar system is a practical, and perhaps, overlooked concept in libraries to greatly advance communication within a public services department. By clearly communicating the daily schedule and library events through an embedded cloud-based web-calendar, a department manager can easily share and update relevant information with staff through a centralized platform. This, in turn can enhance planning and communication of day-to-day events across a department with little effort by an already busy manager. Finding the right solution is the first step; incorporating it in a large and complex organization is the next. Professor Hughes explains the process used to implement a Teamup Calendar in the library for scheduling and staff communication. A unique feature to Teamup is that there is no need to download content or required login account. Setting up the calendar is a straightforward and uncomplicated process. Step 2: Configure the calendar. In my initial calendar setup, I developed eight color-coded subcalendars for the department (see Figure 1). I created one that tracks full-time staff schedules and one for part-time or student workers. Another subcalendar was created for library hours which shifted by semester and final exam periods. Professor Hughes created additional sub-calendars to track staff vacation time or sick days, as well as library functions and meetings and events. Once I created the bones of the calendar, I made reoccurring events based on the more regular scheduling of the department, such as shifts for full-time and part-time staff members, library operating hours, and Lending Services desk coverage. Teamup makes it very simple to create recurring events that repeat daily, weekly (on specific dates), monthly, or yearly based on your preferences. Repeating events can be customized in many ways, and individual events within each series can be altered without changing the entire series of events. Step 4: Share the calendar with staff members. Next, I shared different calendar access permissions dependent on staff status. For full-time staff members, I emailed out the unique URL which contains Modifier privileges. From this link, staff are able to update and modify their own schedule if needed. For example, if I took vacation time, full-time staff could step in and make changes on my behalf. Professor Hughes also set up a read-only calendar link for part-time staff members, and bookmarked the read-only calendar on library computers so that staff could easily reference it as needed. The results: Is Teamup Calendar a good solution? Professor Hughes notes several features of Teamup that make it a powerful tool for organizational functions: embedding a calendar, customizing the look of the calendar, ease of use on mobile devices, searchable calendar data, event reminders, iCalendar feeds, and multiple calendar views. Staff members in the department had very positive first impressions. I sent out a survey after the fall 2017 semester… I received 100% positive feedback regarding the calendar. One staff member commented that it provided them with a complete library agenda for the day which made them feel more confident answering directional questions at the desk. Teamup has become a powerful, helpful tool for streamlining the responsibilities of managing a library. 🔗 Click here to access the article in its entirety. Many thanks to Professor Sarah E. Hughes for writing and sharing this journal article on using Teamup Calendar. Header photo by Kurt Wagner.